Watercolours With Life: How to Paint Roses in a Loose Style. 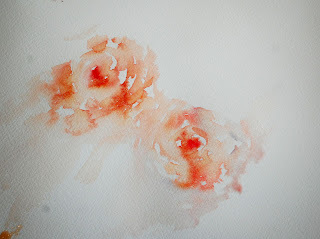 Painting Roses in a Loose Style in Watercolour. Please be warned. Painting roses in this loose style can be very addictive. 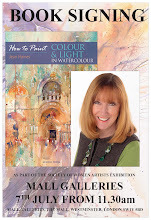 Once you master the technique it is almost impossible to stop trying these with new colour variations and compositions! 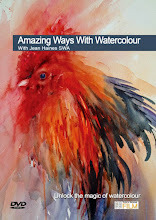 Bearing in mind this is almost a free workshop if you do find this project helpful could I ask you to consider making a small donation to a Cancer Research Charity as a thank you for my sharing the technique. I and many others would be truly grateful for your help if you choose to do so. This image is where you are aiming in the early stages of working without a preliminary sketch. Stage 1. Try to paint a real rose. Have one in front of you. Study its shape and how each petal intereacts with the others. 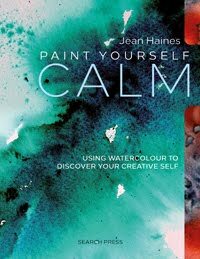 Now put it down and paint from your imagination! I have peach roses here at the moment so this is my choice of colour. 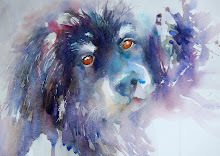 I have two techniques which I often resort to.One starting with placing pigment on wet paper and another starting with dry brushwork. 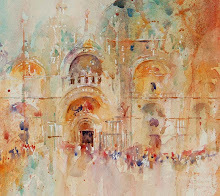 Lets look at how to start with dry brushwork first. Example of Starting With Dry Brushwork. Stage 2. Start painting. Begin with the rose centre as in the above example. 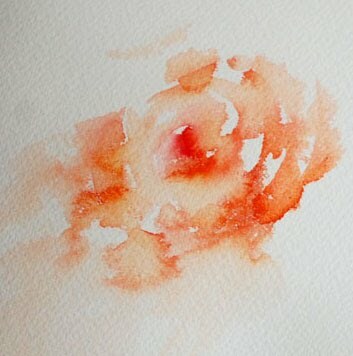 If you look at this dry brushwork marking the centre of the rose you can follow how the first inner petals are added to surround the centre. Stage 3. Take a clean damp brush and soften these first petals while they are still damp so that some of the hard edges disappear. Stage 3 Example. Softening the initial dry brush marks. 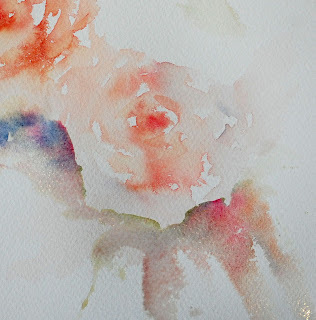 You can build up a full painting by adding more roses as you become more confident at painting each centre. Starting a Second Rose to add to the Composition. Repeat as with the first rose but aim to make each rose slightly different to create more interest in the final result. 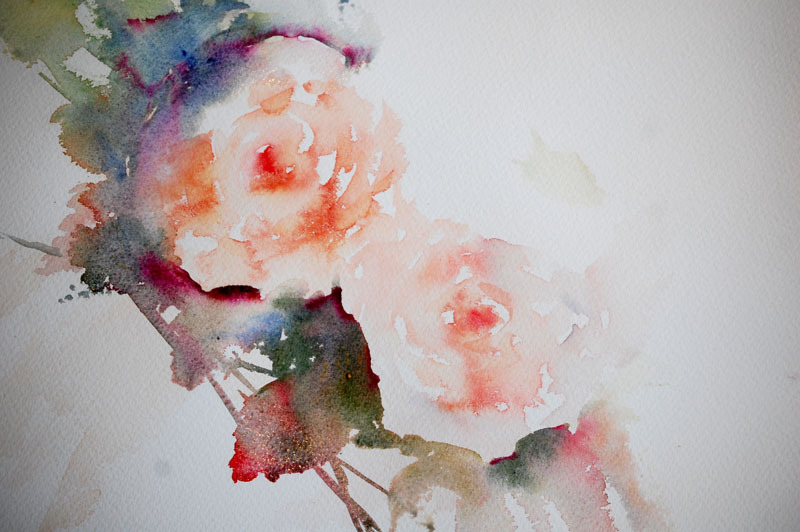 Practise these first stages as much as possible until you can really see roses forming in them. Do not fiddle and do not overwork! Next we will be looking at how to add the background and foliage. The first simple stages at adding a background. Stage 4. Softly add foliage to the outline shape of your rose. Once you have gained conifdence in rose outlines these foliage additions can be bolder in colour. I will be adding further demonstrations for this stage later on in another post. But for now you have some projects to master. 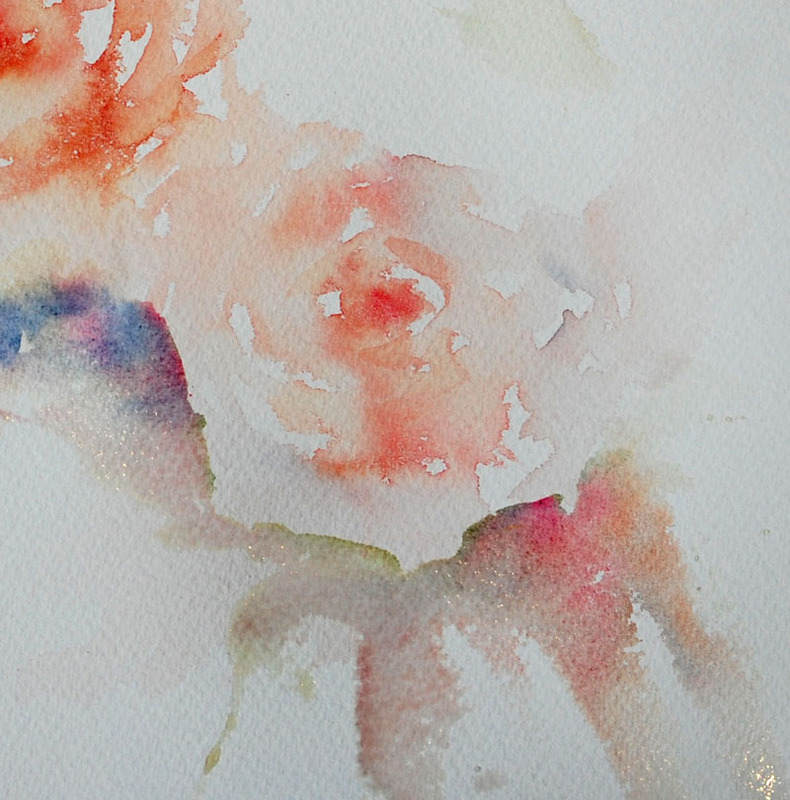 Painting roses in all colours with a dry brushwork beginning! You may find you like the effect of your rose painting without the addition of a background. If you do please leave your study and start a new piece. Never ruin a successful beginning, learn from it for future work. I will add more roses as time goes by with a few ideas on composition. Many students have come to me over the years and adored this way of painting roses in a loose style. I am thrilled to be able to pass on the demonstrations and if we can also help the Cancer Research Foundation I will be over the moon. For personal reasons I really would like to do as much as I can to help. 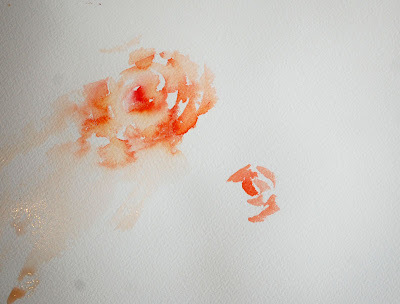 Enjoy getting started in painting roses and I wish you lots of luck! If you do get some wonderful results in these early stages please let me know. I would love to hear from you. Labels: Painting Roses in a Loose Style, Watercolour Roses with no initial sketch. Thank you for sharing this. 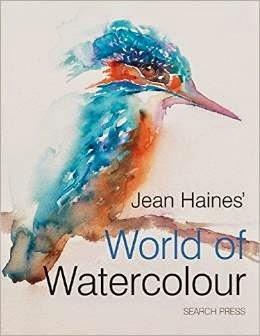 I love working wet into wet and just seeing where it leads, especially with skies and seascapes, but have never really thought about using the same technique for flower painting...I'm excited to try this and will let you know how I get on. Thank you for sharing this. I am eager to try this loose style ~ it's beautiful! 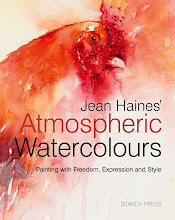 Jean, your work is such an inspiration. 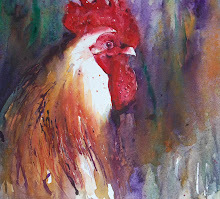 I started drawing and painting this year at 49, having been told at school to stick to physics! Now I am an addict, but particularly f Impressionism...your loose style is magical. But sharing it with Cancer Research is even more inspired, they have received my donation....thank you! Hi from Lubbock TX !! 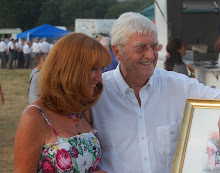 Jean, I must tell you how I love your demo's! You are truly an inspiration to me every time I pick up your book or just think or your style. I love your work! I hope to accomplish one speck of the gift God has given you, and is was FREE to each of us! Thank you so much for your generous attitude toward sharing with us yesterday, in the town that I love so much. Many Blessings to you. 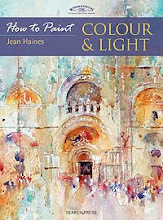 I only started water colours a year ago and came across your first book at the local library about six months ago. I love your style and I am working very hard to learn from your DVDs and books. You are inspirational. Thank you for sharing and passing on ideas so generously.